What’s that old saying about success being 10% inspiration and 90% persperation? With hard work and imagination, Julie Miedtke, UofM Forest Educator for Itasca County, has a knack for making success look like 100% inspiration and 100% fun – something she’s been doing for forest education programs long before she partnered with Vital Forests/Vital Communities to help launch Goods from the Woods. I’m delighted to share the VFVC Blog tribune with Julie to bring you news of some fresh and relevant learning opportunities, timed to piggy-back on the 6th annual GFTW weekend, Sept 20 – 21. See details in Julie’s message, below, and see you at the Splash! One lesson I learned many years ago in college is the value of bringing people together to share research, exchange results, information, ideas and ultimately building community. Our communications teacher professed the importance and value of learning, he likened the impacts of a workshop or a conference to throwing a rock into a lake. People attending the conference get the big splash receiving information first hand from presenters. From that initial splash the news and information ripples out into other groups, neighborhoods and communities. Conferences are valuable tool to share information and resources. On September 19, 2008, the University of Minnesota, in collaboration with Blandin Foundation, Minnesota Department of Natural Resources, and the Itasca county Private Woodland Committee will be creating that “big splash” by sponsoring a conference for family forest landowners. It will take place in Grand Rapids, Minnesota. The Up North and Living Green Conference offers over 20 classes on a wide variety of topics relevant to forestry and natural resources in the 21st century: Bears to Biomass, Carbon Credits to Climate Change, Taxes to Timber and more. The goal of the conference is to disseminate resources information that will ultimately help landowners make wise decisions for their lands, and allow them to directly communicate with scientists, researchers and foresters. Landowners will be able to rub elbows with other landowner and learn from their peers. It is the hope and expectation of the conference organizers and sponsors that participants will, through the variety and quality of classes offered, find opportunity to avenues to foster their relationships with nature and enhance their ethic to care for the land. For more information on the Up North and Living Green Conference can be found on the new website created for family forest landowners: http://MyMinnesotaWoods.org or phone conference coordinator Stephanie Kessler at 218-326-1130. Life sometimes is such a blur that it is hard to keep up! Can it really be that Goods from the Woods is celebrating its 6th season?! I well remember the bone-cold January morning in 2003 when the Foundation’s Vital Forests/Vital Communities initiative first convened a hearty group of visionaries to begin thinking about the possibilities that resulted in the creation of Goods from the Woods: Enhancing Stewardship and Livelihoods. Our goal was to improve the economic viability of nontraditional wood product businesses in our area, increase the utilization of our forest resources through improved forest coordination, and promote sustainable harvesting practices. Since then, GFTW has become a signature event for our region, annually attracting up to 5,000 visitors to Grand Rapids. Inspired by the passion and commitment of Kathleen Preece, Julie Miedtke, John Zasada, and John Reilly, among others, we initially dubbed the event (somewhat quaintly) “the Art, Beauty, and Careful Harvest of Specialty Forest Products (or in shorthand, the “ABCs of SFPs”). Since that brave start, Goods from the Woods has brought numerous world renowned craftsmen and women from Scandinavia, Canada and elsewhere to our region and helped talented local craftspersons and entrepreneurs connect with and learn from them. Check out the lively and visually stunning overview of some of the event’s highlights during its first five years. Below, GFTW 2008 Coordinator Jennifer Lein outlines some of this year’s exceptional attractions. Hope to see you there! 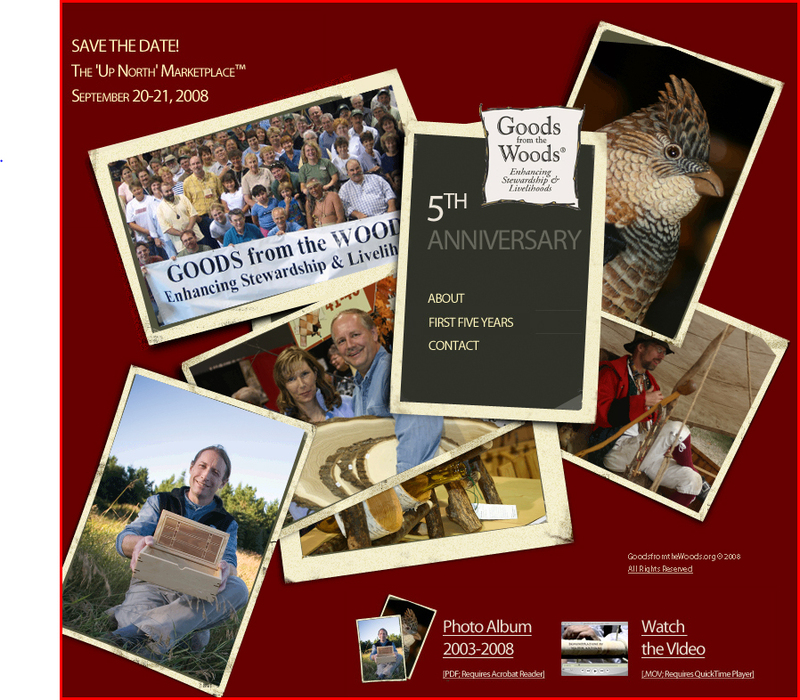 This year’s Goods from the Woods Up North Marketplace takes place September 20 from 9am-5pm and September 21 from 9am – 3pm at the IRA Civic Center in Grand Rapids, MN. Now in it’s sixth season, Goods from the Woods Up is a unique show that attracts a variety of world–class artists and crafts people to demonstrate and share their outstanding ideas, designs and crafts. It is Northern Minnesota’s largest Juried Exhibit. This year’s demonstrations will be rich in color, design and innovation. Demonstrations include: North Folk House, woodcuts and printing, guitar making, Windsor chair making, woodcarving, children’s forest art, interpretive story telling, log home building and music by local artist Sam Miltich.